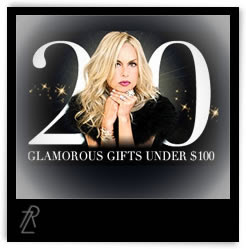 Check out the RZoer's 20 Glamorous Gifts Under $100 Guide!! She has a little bit of everything in this guide for guys and gals, alike. Might I add, some good (no) GREAT stuff is in the guide. What would I do without Rachel Zoe and ALLL of my other fashionable inspirations, June Ambrose and Joe Zee (included)? Toodles!! Click the picture above to jump to the guide.